Although you likely don’t give it much thought, your main sewer line is perhaps the most important component of your plumbing system. It is one of the two main plumbing lines connected to your home, responsible for removing all the wastewater from inside your house and pushing it into your city’s civil sewer system. Sure, it can be quite easy to forget about as it is hidden underground, but trust us, when there is trouble, you are bound to notice. When trouble arises, you are certainly going to be glad you saved your local plumber’s number for 24-hour plumbing in Orlando. Holding off on much needed main sewer line repairs can be, as you might imagine, gross. You are going to want to schedule your repairs at the first sign of a problem, which is why it is important to be aware of these signs. So below, we have listed them for you. Keep reading to learn more! Any leak that occurs underground can cause puddling in your yard. If your yard is particularly soggy, it is in your best interest to contact a professional plumber right away. Chances are if your yard is soggy, the problem has been going on for quite a while. Maybe it’s just that you have a green thumb or you treat your lawn with expensive fertilizer. Or maybe, you are dealing with a leaky main sewer line. It may sound a little gross, however, a leaky main sewer line is going to act as a fertilizer for your lawn. Yes, you might now have the most beautiful lawn in the neighborhood, but a broken sewer line is definitely not something you’d want to show off. A clog in your plumbing system will result in slow drains. 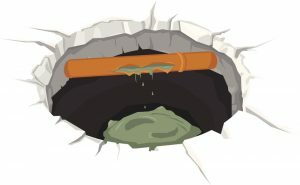 If there is a blockage in your main sewer line, though, you will notice that multiple drains around your home are having trouble draining. Therefore, it is important to contact a pro right away. The excess moisture due to a plumbing leak provides the perfect environment for mold and mildew to grow. As you may know, mold can be a health hazard if not dealt with right away, so you want to be sure to hire a professional plumber to address the root of the issue. The last thing you would expect to hear if all your faucets are turned off is the sound of running water. If you continue to hear the sound of water even after you’ve double checked all your faucets, you likely have a leak on your hands. Be safe, and call a plumber ASAP! As you might imagine, a leak in the main sewer line can get pretty stinky. Trust your nose, and contact a professional right away if you notice any foul odors coming from any of the drains around your home. To schedule your plumbing services, contact the experts at Modern Plumbing Industries, Inc.